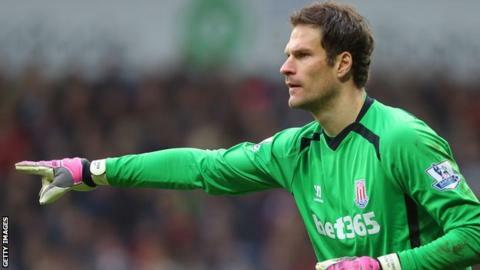 Stoke City manager Mark Hughes says the club plan to discuss a new contract with goalkeeper Asmir Begovic at the end of the season. The Bosnia-Hercegovina international has one year left to run on his current deal and has been linked with a move away from the Britannia Stadium. The 27-year-old joined Stoke in 2010 and Hughes wants him to stay. He said: "We've made it clear we want him to sign. We will discuss it in the summer. That's always been the plan." Begovic is Stoke's first-choice goalkeeper ahead of Thomas Sorensen and England international Jack Butland. Butland, 22, signed a new four-year contract with the Potters last month.